The women of the Alpha Sigma Alpha sorority tug Saturday afternoon. They ended up winning first place in the Tugs competition. 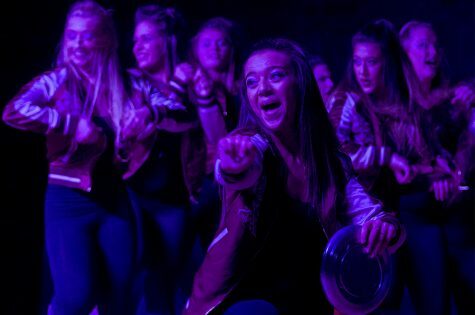 An intensive week of Tugs culminated Friday and Saturday when three teams walked away with the coveted first place titles in this year’s “The Endless Summer” Greek Week. Teams that took first include Sigma Nu in the Big Men’s division, Lambda Chi Alpha in the Little Men’s division, and Alpha Sigma Alpha in the Women’s division. Second and third place winners were concluded after the consolidation rounds on Saturday. Second-place teams include Lambda Chi Alpha for Big Men, Sigma Alpha Epsilon for Little Men, and Sigma Sigma Sigma for Women, while the third-place teams include Sigma Pi for both Big and Little Men and Alpha Phi for Women. 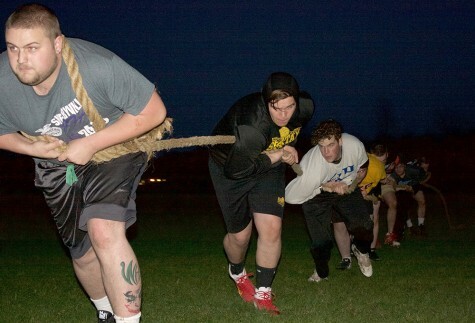 After Tugs came to an end, the overall Greek Week winners were determined. 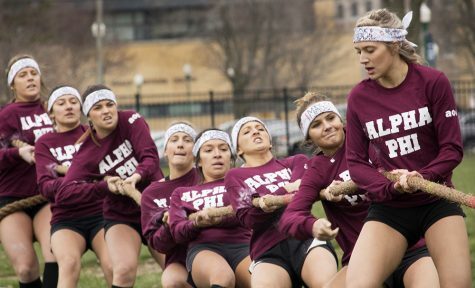 In order from first to third, the sorority winners were Alpha Phi, Delta Delta Delta and Delta Zeta. From first to third, fraternity winners were Sigma Pi, Sigma Phi Epsilon and Sigma Alpha Epsilon. The championship Big Men’s Tug featured Sigma Nu pulling Lambda Chi Alpha Tuggers to the ground with the snap; after finding their footing, the men of Lambda Chi Alpha kept up the fight until hitting the water at 1 minute, 33 seconds. 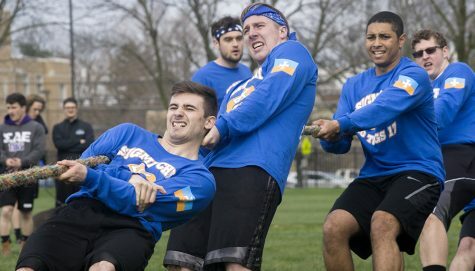 Mark Galvan, a Tugger on the Sigma Nu Big Men’s team, said his team “destroyed the snap” and made history for their fraternity, as they have never won in the Big Men’s division before. After winning the semi-final Tugs against Sigma Pi on Friday, Galvan said his teammates almost lost hope before defeating their opponents at 3 minutes, 4 seconds. Galvan said his teammates planned to celebrate their first-place victory by having a “huge party,” as they had been laying off drinking and practicing six days a week to prepare for the tournament. 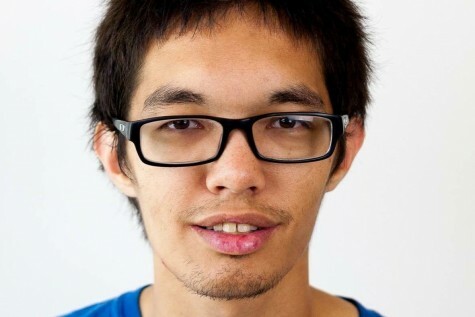 “The guys who get on your team for the ropes, they become like your second fraternity kind of, like you guys have a bond that no one else in the fraternity has together,” Galvan said. The Little Men’s championship Tug ended with Lambda Chi Alpha pulling Sigma Alpha Epsilon into the pond at 1 minute, 49 seconds. This Tug was anyone’s game, as neither team started off with a clear lead. James Smith, a Tugger on the Lambda Chi Alpha Little Men’s team, said his fraternity made it to the finals in this division for the past five years, and this is their second year in a row winning first. “We had a bunch of new guys too, so it’s nice to see new guys go to the championship as a freshman,” Smith said. This more challenging victory came after Lambda Chi Alpha defeated Sigma Phi Epsilon in 15 seconds in the Little Men’s semi-finals on Friday, the fastest win out of both days. 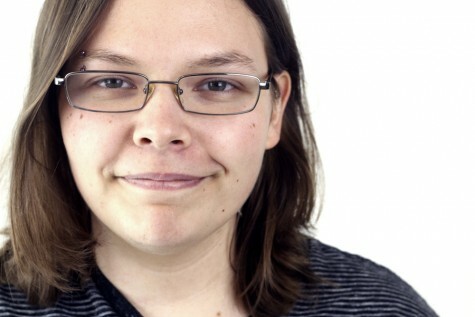 “The 15-second Tug wasn’t really a lot, so it was nice to have a good Tug under our belts,” Smith said. Michael Florczyk, a Tugger on the Lambda Chi Alpha Little Men’s team, said after the semi-finals on Friday that the 15-second win was not something to get their hopes up too much about, as the other team only had eight Tuggers to Lambda Chi Alpha’s 10. 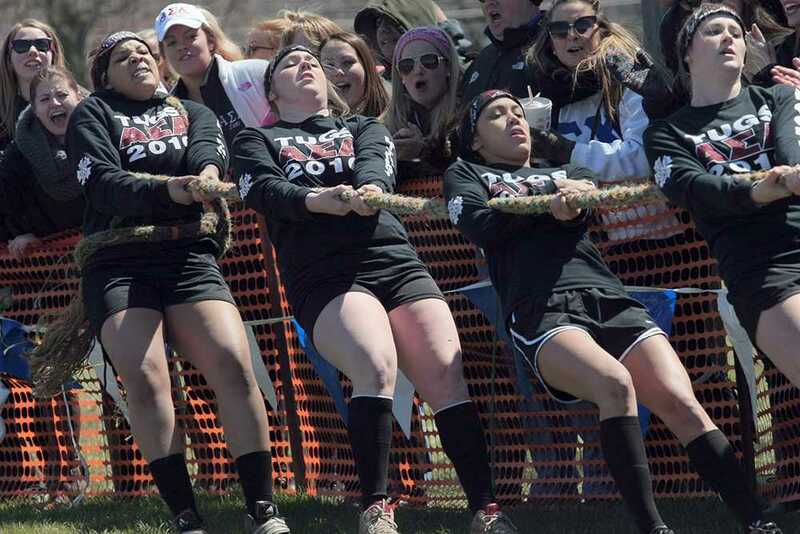 The Women’s championship Tug saw Sigma Sigma Sigma Tuggers begin to sway toward the crowd of people cheering them on until Alpha Sigma Alpha finally pulled them into the water at 1 minute, 51 seconds. This win followed Alpha Sigma Alpha beating Alpha Phi in 2 minutes, 42 seconds in the semi-finals and being the only team on Friday to claim a victory from the west side of the pond. 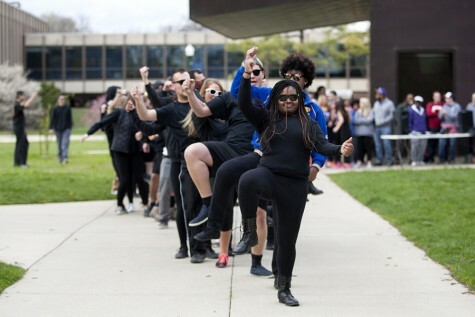 Grace Narcisi, an Alpha Sigma Alpha Tugger, said after Alpha Sigma Alpha’s win on Friday that her teammates were nervous at first because their side had not seen a win all day. Narcisi said it happens every year that one side of the pond will have an advantage depending on the conditions on the day of the competition. On Saturday, the wins were more spread out between the two sides. Both first place Men’s teams hailed from the west side of the pond, while Alpha Sigma Alpha was on the east side closest to campus. For the Big Men’s consolidation round, Sigma Pi defeated Sigma Phi Epsilon with a time of 1 minute, 36 seconds. The Little Men’s consolidation round was also supposed to pit Sigma Pi against Sigma Phi Epsilon. Jessica Nolan, a member of the Greek Week steering committee, said Sigma Phi Epsilon forfeited the competition faced with injuries and being short Tuggers, so this round was canceled. 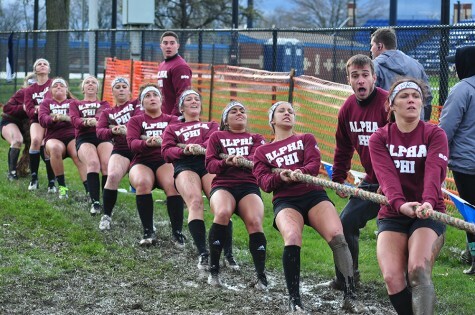 Consolidation Tugs ended with Alpha Phi defeating Alpha Sigma Tau in the Women’s division with a time 45 seconds. 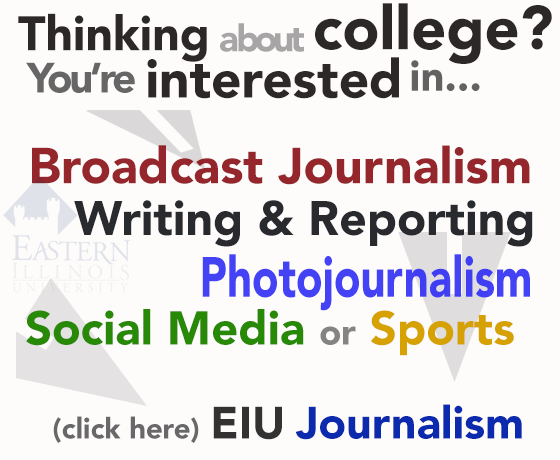 In the consolidation rounds, Sigma Pi and Alpha Phi both claimed their wins from the east side.